The Mongolian death worm (Olgoi-Khorkhoi - "large intestine worm") is an alleged creature reported to exist in the Gobi Desert. The Mongolian Death Worm is a gigantic creature reported to live in the Gobi Desert of Mongolia, Thar Desert of India and Pakistan, and western tip of Northern Africa. Reports are relatively frequent, and are often unconfirmed. The Mongolian Death Worm's native name, Olgoi-Khorkhoi, means "intestine worm", due to its red blood-like color, and size, which is the size of an intestine. It has been described by many to be from five to two feet long, have the ability to spit out toxic poisons or stomach acid from its body to make it unappealing to predators, or self defense. 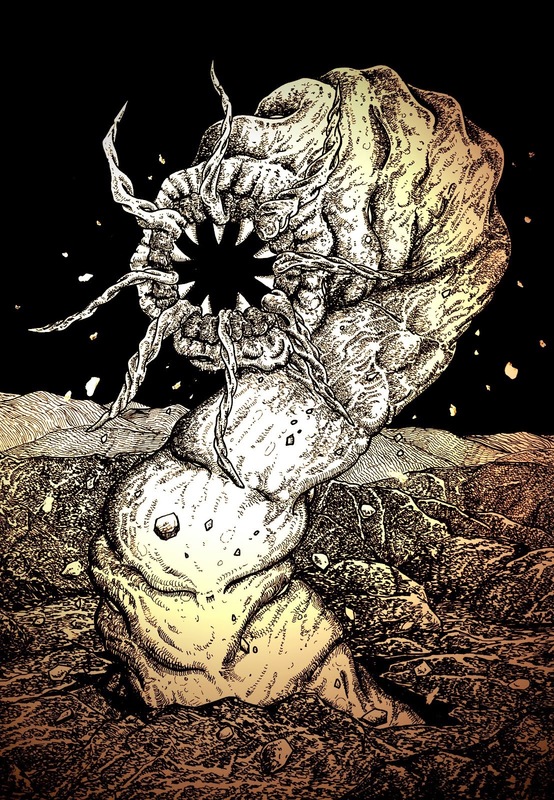 The worm, described by numeous locals, changes its pigment to a bright yellow when threatened, and then attacks any human or larger prey at this state, and, with its several lawers of teeth, it "drills" itself into its prey's body, eating it from the inside, like a sea lamprey eats its prey. Although some believe the Mongolian Death Worm to be a legless reptile, this reptilian description does not match the descriptions of the local reports. The Mongolian Death Worm is a fat, red, deadly snake-like monster that looks similar to a cow’s innards. 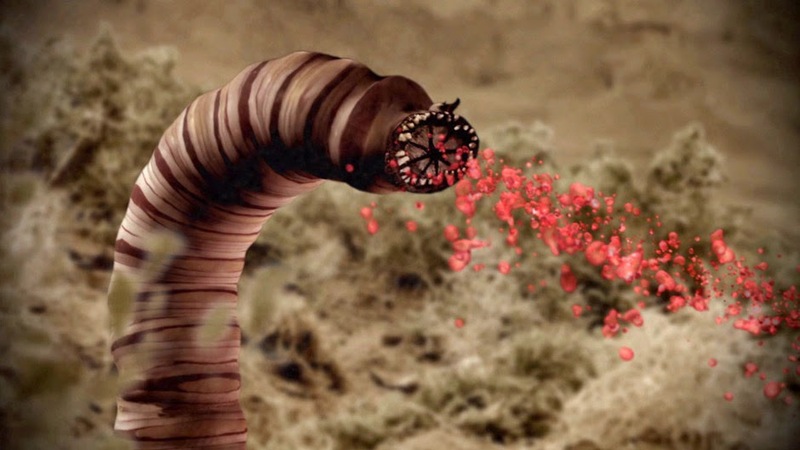 This giant worm, measuring up to four feet long, can kill people instantly. How it does it, no one knows. Some believe it spits a lethal toxin, others say it emits a massive electrical charge. However, it kills its victims quickly, and can do it from a distance. 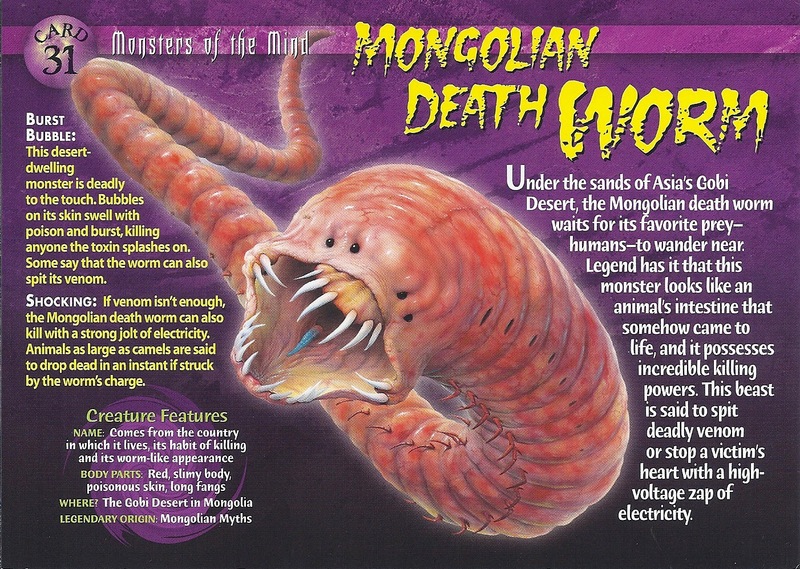 Western culture has come to call this monster the "Mongolian Death Worm." Mongolian nomads believe the giant worm covers its prey with an acidic substance that turns everything a corroded yellow colour. Legend says that as the creature begins to attack it raises half its body out of the sand and starts to inflate until it explodes, releasing the lethal poison all over the unfortunate victim. The poison is so venomous that the prey dies instantly. Because Mongolia had been under Soviet control until 1990, very little was known about the Death Worm in the West. In recent years, investigators have been able to look for evidence of the creature’s existence. 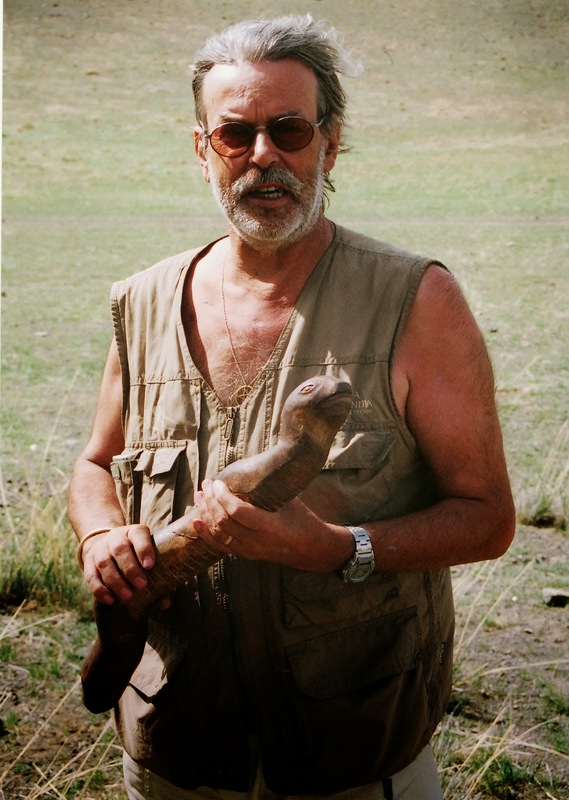 Ivan Mackerle, one of the leading Loch Ness Monster detectives, studied the region and interviewed many Mongolian people about the worm. Due to the sheer volume of sightings and strange deaths, he came to the conclusion that the Death Worm was more than just legend. Nobody is entirely sure what the worm actually is. Experts are certain it is not a real worm because the Gobi Desert is too hot an area for annelids to survive. Some have suggested it might be a skink, but they have little legs and scaly skin whereas witness accounts specify the worm is limb-less and smooth bodied. The most probable explanation is that it is a type of venomous snake. Although the native Mongolian people are convinced of the Death Worm’s nature, it will take more years of research to satisfy the rest of the world’s scientific community. An easy way to survive an encounter with it is to never wear yellow in its presence. If you do it will go into an acid spitting rage. The acid will then melt your skin and you will be dead. If not, pour water on you as fast as you can to wash it off. 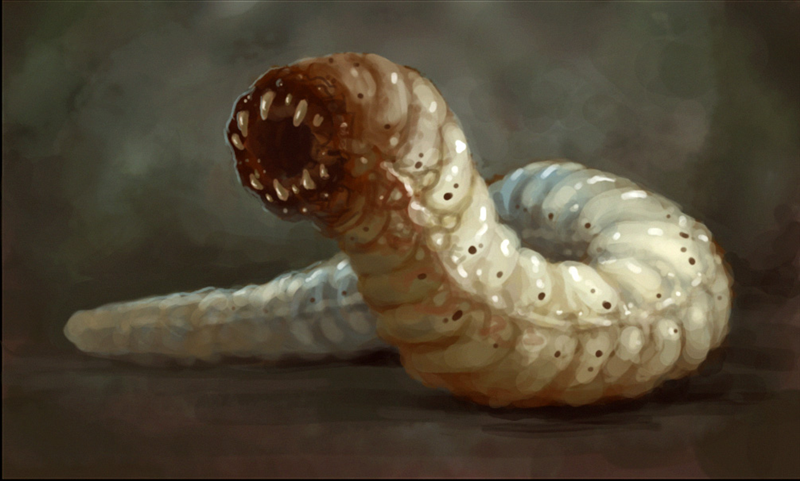 Personally I love the idea of the Mongolian Death Worm, but maybe that's because it just reminds me of "Tremors". Do I think it exists, never say never.